While the majority of Chinese restaurants are likely to give themselves a break during the Lunar New Year to indulge in all the season’s festivities, little do many realise that the restaurant scene will still be fairly active during this period of celebration. 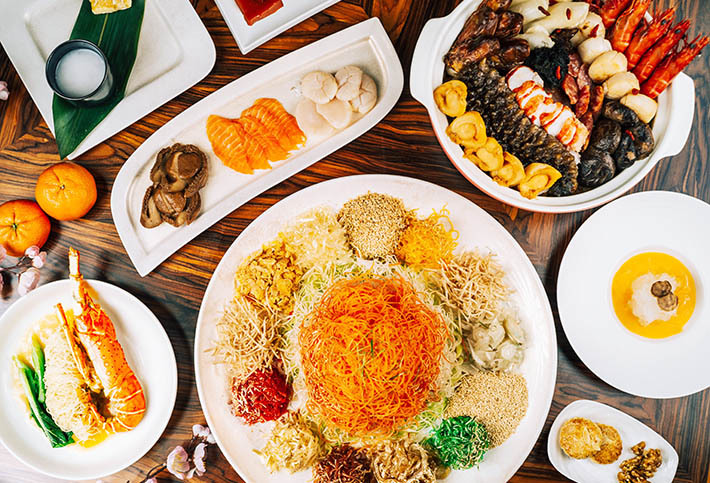 Whether it’s a seafood feast you crave, a dim sum brunch to commence the weekend proper, or a luxurious buffet spread that features a myriad of traditional Chinese New Year delicacies and more, the options are pretty much inexhaustible. Panicky because your family has no reunion plans during the Lunar New Year? Stay calm, help is here. Here is our list of 19 Chinese restaurants that will stay open during Chinese New Year 2018. 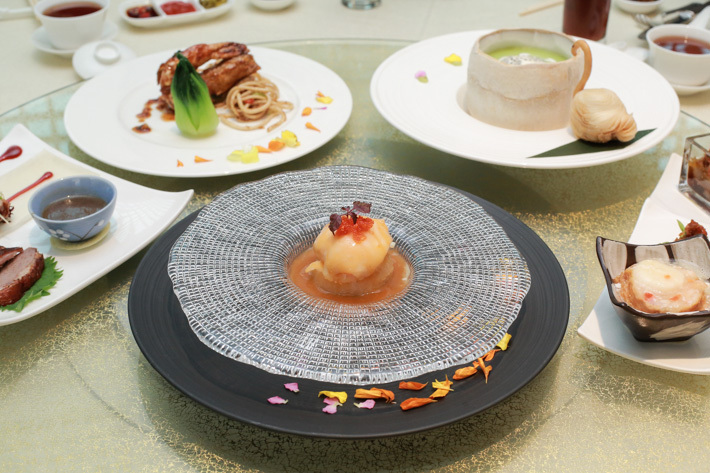 Indulge in a selection of auspicious delicacies from at 10 at Claymore at Pan Pacific Orchard this Chinese New Year. Capturing the flavours of both new and traditional favourites, you can expect a lavish myriad of gourmet delicacies, diners with an affinity for gourmet delicacies that capture the essence of traditionally cooked dishes are bound to be spoilt for choice. Better yet, we are giving you the opportunity to experience it all without breaking the bank. Simply quote ‘LIC-CNY’ to enjoy an all-you-can-eat indulgent feast at S$42++ for two for the à la carte set lunch and S$108++ for two for the dinner buffet. This exclusive promotion is valid from 22 January to 28 February 2018 every day of the week. Loyal supporters will also get to enjoy 25% savings on all other à la carte dishes for lunch on weekdays. Specialising in Cantonese fare and their exceptionally comforting double-boiled soups, Canton Paradise is one of the few gems that will remain open for lunch during the festive season on 16 February 2018 from 10.30am to 2.30pm. One of the most beautiful Chinese restaurants in Singapore, Cherry Garden at The Mandarin Oriental offers an eclectic menu of Cantonese cuisine, presented with artistic modern flair. Cherry Garden will be open from 8 February 2018 right through to 2 March 2018 and will feature a myriad of Chinese New Year-themed menus. This Lunar New Year, usher the Year of the Dog with Ginger’s value-for-money buffet that will feature Boston lobsters in its Prosperity Trio that comprises an all-new Prosperity Lo Hei that swaps out the traditional salmon slices with luscious chunks of Boston Lobsters as well as Wok-Fried Lobsters in Superior Stock and Pen Cai. Award-winning restaurant Golden Peony located in Conrad Centennial Hotel is one to dazzle, from its stylish plating to its elevation of modern Chinese fine dining. Luxuriate in a medley of exclusive CNY delicacies made available in both their CNY a la carte and set menus that will be available from 5 February 2018 to 2 March 2018. A celebrated stalwart in the Chinese fine dining scene for over two decades now, Hua Ting stands as one of the leading Chinese restaurants in Singapore. Hua Ting will be open on all 3 days of Chinese New Year and it is a great option to consider to have your CNY reunion this year. Offering diners in Singapore Cantonese-style cuisine and gourmet dim sum that epitomizes sheer elegance for nearly the past decade, Jade restaurant is truly one to impress especially during the coming festive season with their no-holds-barred CNY weekday and weekend lunch menu. This colossally popular seafood chain will be open only for dinner on the first day, with 9 celebratory set meals to choose from. Prices start from S$208 for a six-course dinner for four. What you can look forward to at LingZhi Vegetarian restaurant this year is the vegetarian Take-Home Feast which includes classic CNY dishes such as Longevity Treasure Bowl (Pen Cai), Thai-Style Deep-Fried Vegetarian Fish and more. Prices start at S$268+, and there are several Take-Home Feasts that are great for 6 to 10 people. Man Fu Yuan at InterContinental Singapore is renowned for serving up excellent Cantonese fare with a bold and modern approach. Let your senses take flight as you embark on a flavour trip with one of the 5 festive menus (Prosperity, Success, Abundance, Harmony and Fortune)—all curated and handcrafted by Executive Chef Eric Neo and his team of experienced chefs. Available until 2 March 2018, the menus include auspicious highlights available from S$118++ per guest. Read more about Man Fu Yuan’s 5 luxurious menus for Chinese New Year 2018 here. 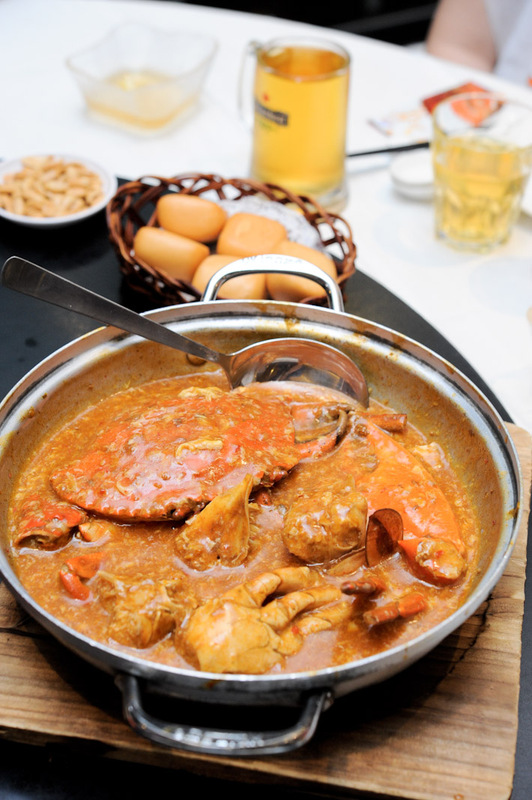 Renowned for serving some of the best Chinese cuisine in Singapore, Min Jiang features a repertoire of popular Sichuan and Cantonese dishes as well as a delectable selection of dim sum. CNY sets start from S$168 and will be available from 29 January 2018 to 2 March 2018. Toss to a greater prosperity with Si Chuan Do Hua’s one-of-a-kind Yu Sheng with Fugu Sashimi. Prices start from S$198 per person and all Chinese New Year Specialties are available from 15 January 2018 to 2 March 2018 across all 4 outlets island wide. 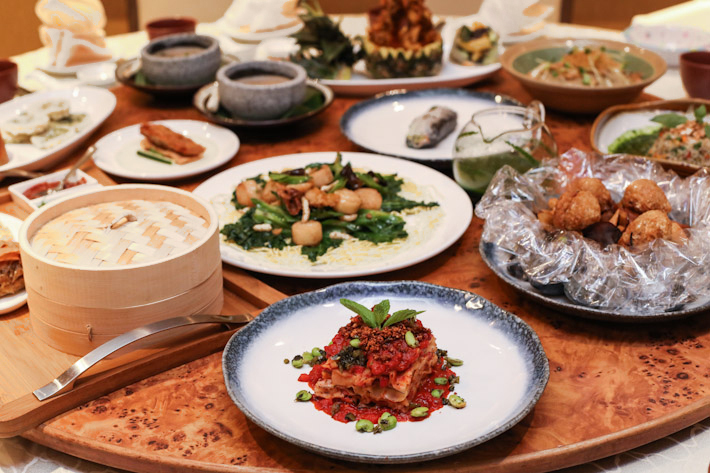 Located on the second level of the recently launched Mercure Singapore Bugis, Song Garden astounds with its array of elaborated and mouth-watering contemporary Cantonese dishes. 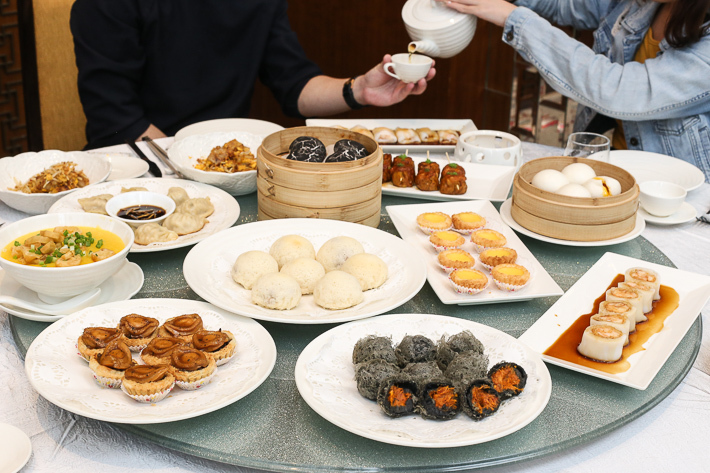 Treat your family to a wonderful dim sum meal which features an array of classics as well as some modern interpretations. Song Garden will be open on both the first and second day of Chinese New Year for lunch and dinner. Spice Brasserie at PARKROYAL On Kitchener Road celebrates the arrival of the Lunar New Year with an array of mouth-watering auspicious delights where you can expect Chinese New Year classics as well as Nyonya flavours all in one place. Known for their crabs, Executive Chef Kelvin Chuah and his team have created an extensive line-up with a Peranakan twist that features the Lucky Fortune Set which will be served right at your table for dinner buffet on 15, 16 and 17 February 2018. This luxurious set includes Salmon Yu Sheng, Baked Sea Scallop With Mushroom Cheese, Braised Abalone with Duck Feet, Braised Sea Cucumber With Roasted Pork and Nanas Lemak Lobster as well as free flow soft drinks. Simply quote ‘ladyironchef’ upon making your reservations to enjoy 20% off Spice Brasserie’s mouth-watering lunch and dinner buffets. Located at Park Hotel Alexandra, The Carvery is the perfect place for meat lovers to feast at. Prices for the buffet from 22 Jan 2018 to 2 March 2018 starts from S$48.80 per adult for lunch and S$68.80 per adult for dinner. Triple Three is the place to head for this festive season if you are looking for an international buffet and classic CNY specials at the same time. Opened on all days of CNY, Triple Three is a great option to consider to have your CNY dinner this year. Known for their traditional and quality Chinese cuisine, Tunglok Heen will impress you with their extensive selection of CNY specials this year. Available from 02 January 2018 right through 02 March 2018, treat your family to an incredible mouth-watering feast this coming festive season. Diners can expect only the best at Singapore Marriott Tang Plaza Hotel’s award-winning Wan Hao Chinese Restaurant. Besides CNY ala carte specials, the CNY feasts are also available from 16 January 2018 to 02 March 2018 starting from S$108.80 per person. Nestled on the fifth level of National Gallery Singapore, Yan offers a menu of Cantonese delights in modern presentations. Available from 1 February 2018 to 2 March 2018, there will be 7 different CNY sets to indulge in and prices start at S$118 per person. For more recommendations, read our guide on the best Chinese restaurants in Singapore.